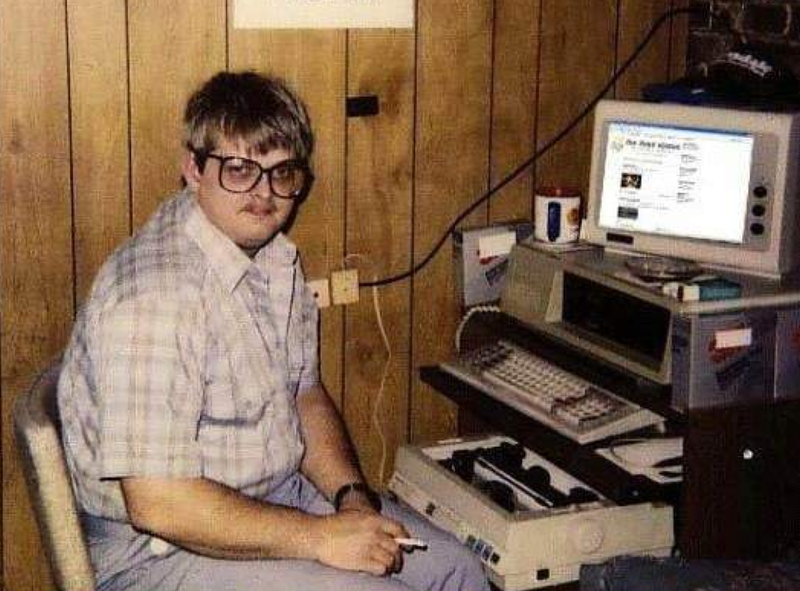 We all have a friend who knows how to build websites and mobile apps. Let me guess: you sent that friend a Facebook message telling them you have an awesome idea for a mobile app. Did you ask your friend if they could help you build it? Or did you ask them how to build it yourself? I’m guessing yes because it appears your friend replied with a link to this article. 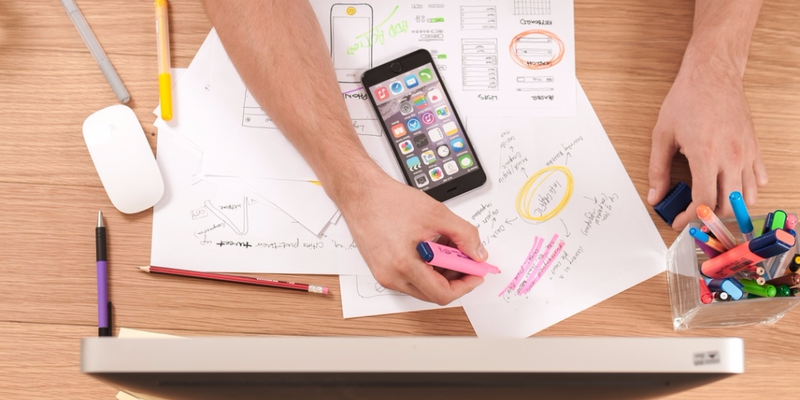 Well, you’re in luck because this is the ultimate article on how to turn your awesome idea in a successful mobile app in 3 easy steps. Make sure to thank your friend when you’re finished reading. (Go ahead and click that little heart at the bottom too ;-). 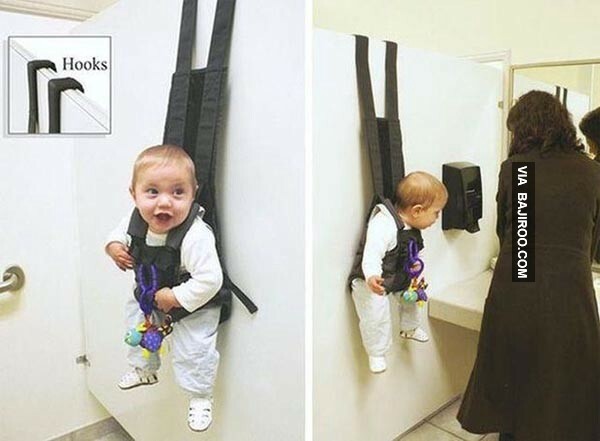 No hands baby holder for public restrooms. Genius! via bajiroo.com. Not everybody has awesome ideas. Only geniuses and the truly creative. Well, your mom was right: you’re special. Because you wouldn’t be reading this if you didn’t have an awesome idea for a sick mobile app that’s definitely going viral. But what’s an awesome idea for a mobile app if it never gets built? A terrible idea, that’s what! So, let’s get to building it. Wait. There’s an important step you can’t skip! You have to prove your idea is awesome. Don’t worry: there’s a quick an easy way to prove how awesome that idea is. That proof comes in the next two steps of how to turn your awesome idea into a successful mobile app. Supplies: blank paper, a pen, real people. Here’s what the pros do: Draw out your idea on paper. Actually draw it out. I don’t mean write down your business plan in words and plan out how many millions of people are going to download it at $0.99 a pop making you $990,000 for every million (minus Apple’s and Google’s fees of course). I mean draw that thing out with boxes and circles. Don’t worry. It doesn’t have to be pretty. 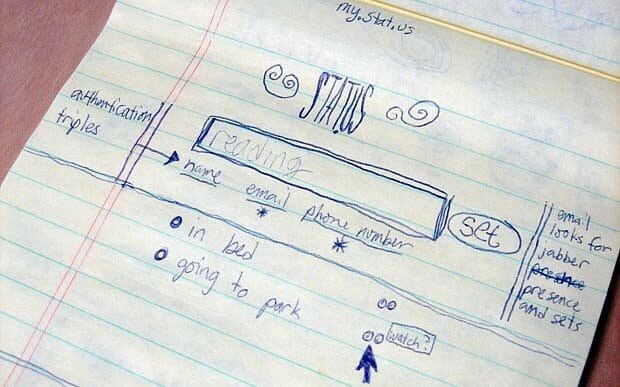 Look at the original idea for Stat.us, aka Twitter. Ug.ly. Draw the landing page. What does the first screen look like when somebody opens your app. Then draw the next screen. Do they need to sign in? Can they sign in with Facebook or Google accounts? Can they register with just an email and password? Draw it out. You know what it looks like. You’ve seen it on all the billion dollar apps you use like Instagram, and that other one. Then what do they see? Draw it on another sheet of paper. Is there a navigation bar at the bottom? How many? What are the icons? Where do they lead? Is there a hamburger menu in the top right? You know, the 3 horizontal lines. Or is it a gear icon (for the app’s settings)? We’re just getting start. You’re about to earn those millions in these next actions you take. We’ll seal the deal in step 3. So, your user is logged in, and looking at the home screen of your awesome idea which is almost a mobile app (on paper). Now what can the user click on from that home screen? Draw a new page for each action. Where does it take the user when they click on each of the navigation buttons? Squares and circles. You got this! Let me help. Go here and download these paper templates. Print them out (or just copy the idea as best you can on your paper). 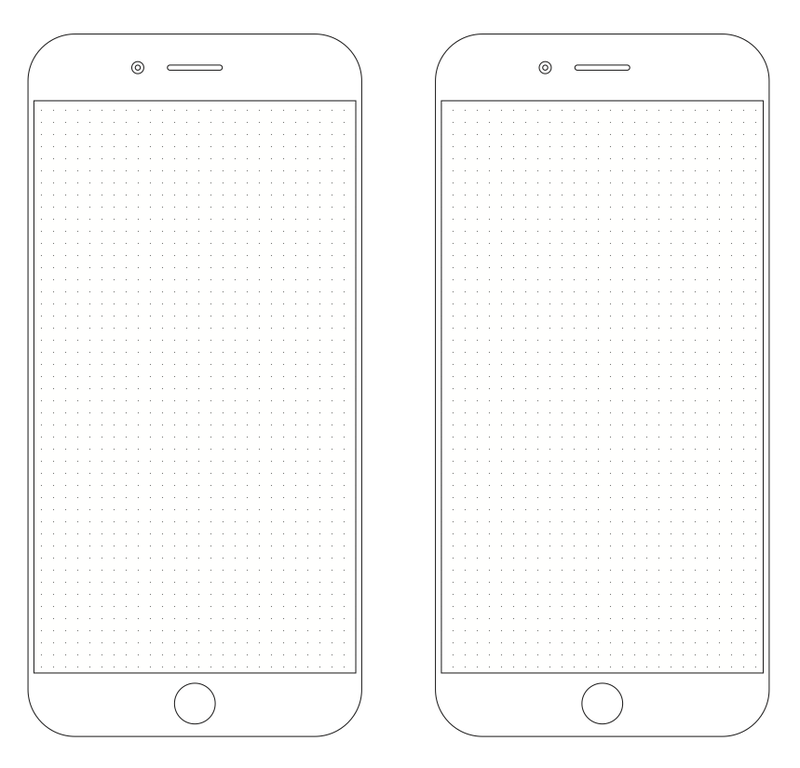 Then get to drawing each screen of your mobile app. The more the merrier! … you’re still drawing, right? I’ll wait. Come back when you’ve got most of your screens drawn out. Once you’ve got your idea all fleshed out on paper, it starts to become real. If you’ve actually drawn out your idea, you’re ahead of 90% of the competition. Most people don’t get this far. But being in the top 10% isn’t good enough. We’re taking you to the top 1%! Are you ready? This is a critical difference between winning and losing. Take those designs to your roommate, your sister, your mom and dad, and your uncle. Get them in the mindset of having the problem you’re going to solve. “Dad, you’re at Chile’s and just got served the chocolate lava cake. It looks amazing. You want all your friends to see how awesome it looks. You whip out your phone and open up this new app I’m developing called Food-stagram!” Now your dad is ready. Then show them screen one and ask him to post a picture of that lava cake. Tell him to touch the paper like it’s a mobile phone and that you’ll manually switch the screens with the other paper prototypes you’re holding in your hand. Your dad will be so proud of you testing out your awesome mobile app idea on him. The key here is to see where your dad trips up. Does he understand what each of the buttons you drew mean? Can he successfully progress through your app just like you imagined? Of course he can’t! He’s your dad! He’s so dumb with technology! Uggh! Wait, that’s great. You want to tweak your designs to be so dumb that even your dad can use it. Whaaaat?! Really?! So listen to your dad. What does he find confusing? What does he understand? What’s he looking for? Don’t be afraid to tweak your designs. Now go test it on your mom. Lather, rinse, repeat. Uncle Jimmy. Auntie Sue. They love you. They’re not going to steal your idea, and they sure as heck aren’t going to build it themselves. And yes, test it on your roommate, your girlfriend, and all your friends who you think would love the app and share it with all of their friends. Wait, but it’s not built yet. Don’t worry. Like I said, if you drew the designs, you’re already 90% ahead of the game. And now that you’re actively testing and refining your idea (like the genius you are), you’re 99% ahead. They couldn’t catch you if they tried. Okay. You’ve tested, tweaked, and refined your design so that everybody is raving about it. Your friends are asking you when you’re going to build it because they can’t wait to use it! This is what you’ve been waiting for. Are you ready for step 3? This is where the app actually gets built. Go hire a mobile app contractor to build that app for you. You’ve done the dirty work. You came up with the idea. You put it down on paper. You tested it on everybody you know and updated it along the way with better circles and squares. You idea is ready for the primetime. Don’t waste your time trying to learn how to code. Hire a small team of mobile app developers to build that app for you. Time to put your money where your mouth is. Heck, maybe your rich uncle will invest in your idea now that it’s basically proven. Seriously, unless you want to to develop mobile apps for a living, there’s no need to learn Swift or Java. Pay somebody to build the app, and you can focus on the margaritas and beaches. I mean, marketing and business management.